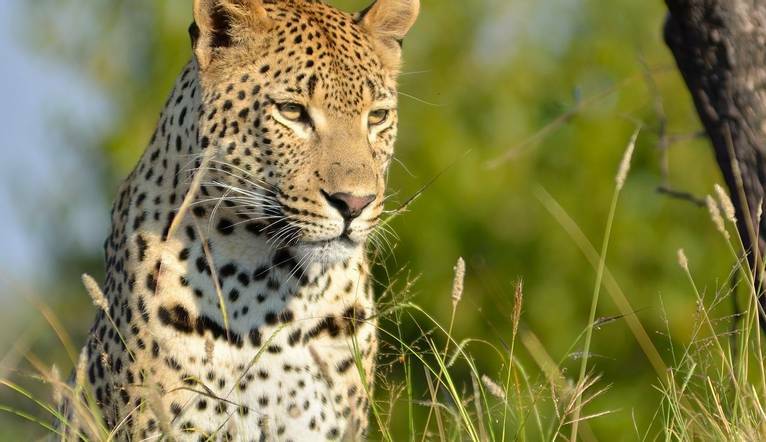 Our fabulous South African Safari offers both game drives in the famous Kruger National Park and also a week staying right on the edge of this park – surrounded by amazing scenery and incredible wildlife. 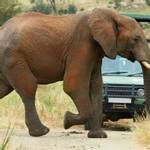 We are in big game country here and it is not unusual to see the Big Five on one game drive. This well-established park was set up at the end of the nineteenth century by Paul Kruger, then President of the Transvaal, who recognised the need to protect the animals of the Lowveld. Day 1 – Johannesburg to Nkambeni. After arriving in Johannesburg we drive to our tented lodge inside Kruger National Park with a break for lunch on the way. Our accommodation is more glamping than camping and surrounded by the wild beauty of a natural African landscape. 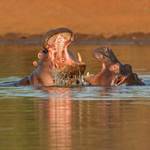 You may see some hippos around the rock pool while enjoying your pre-dinner drink. Our lodge has its own private game reserve and our first game drive, this morning, will take us through this reserve. All our game drives are in open vehicles which offer the best and safest viewing of animals – blankets are available to ward off the early morning chills. This area is best known for its large herds of elephants. Early morning is the best time for game viewing in the Kruger National Park so we will take a packed breakfast when we set off on a full day game drive through the park. Covering over seven thousand and five hundred square miles this park offers one of the best wildlife experiences in Africa. Its inhabitants include the Big Five: lions, leopards, rhinos, elephants and buffalos as well as hundreds of other mammals. Numerous different species of birds such as vultures, eagles and storks fly above its open plains. We will have a break for lunch at the Skukuza rest camp inside the park. On our return to our lodge there will be time to relax around the rock pool before your evening meal. This morning is at your leisure and a chance to indulge in a late breakfast and some relaxing time by the pool. 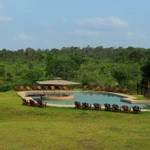 There is also the option of an early morning wildlife walk with a guide from the lodge. 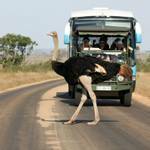 In the afternoon we will be back on board our vehicle for a second game drive in the Nkambeni Game Reserve. Dinner included at the lodge. This area is not only about wildlife so today is a good opportunity to take a trip to explore some interesting archaeological sites – there are over two hundred cultural heritage sites in the park. Or you may wish to take in some of the dramatic scenery here including the Three Rondavels, Blythe Canyon, Gods Window and the Burkes Potholes. 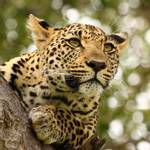 Another option, taking advantage of your proximity to Kruger Park would be to book an extra game drive. All these activities can be arranged with the lodge manager. Tonight there will be a special cultural evening at the lodge, including traditional Shangaan singing and dancing – so don your frilly skirt and get ready to join in. Today is your second day at leisure and another chance to choose from a good selection of optional activities available through the lodge. This morning we have our last game drive, through the Nkambeni Game Reserve. After which the rest of the day will be at leisure. Day 8 – Nkambeni to Johannesburg. This morning, after breakfast, we drive back to Johannesburg for our flight home. Everything was very well organised. An all-round lovely experience that I would definitely recommend! This was my 6th holiday with Solos and I've thoroughly enjoyed them all. Great safari trip. Well managed and I would recommend it to others. 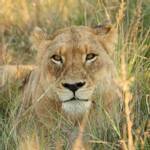 Fabulous Safari experience seeing all the Big Five and so much more. The whole holiday was a highlight, well organised and looked after by knowledgeable guides. Just a short drive from the Numbi Gate entrance of Kruger National Park our tented lodge’s main facilities include a restaurant, lounge area and a bar. Sit back and watch the world go by from the verandah with its views over the Kruger National Park and the hotels freeform swimming pool. The viewing deck overlooks the dam with its own resident hippo. Dinners are in either the restaurant at the Lodge or in the ‘Boma’ (an area in the bush next to the main tent). Our permanent timber and canvas tented rooms built on wooden stilts are constructed to have a minimum impact on the natural environment. They all come with their own decking area, air-conditioner, wardrobe, tea/coffee-making facilities and en-suite bathroom with indoor and outdoor shower. The transfer from Johannesburg airport to the lodge is an easy drive of approximately 5 1/2 hours. A refreshment stop will be made en route, with lunch included on the way to the lodge. Some additional safari experiences may be available to you during your trip depending on the time of year and numbers interested. Full details of all the excursions available will be advised at the Information Meeting. All tours should be paid for in local currency only. 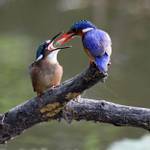 Your Tour Leader will help arrange these for you but may not necessarily accompany you. 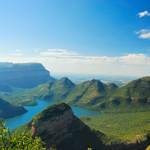 Full day panorama tour, including the Rondavels, Potholes & God’s Window. We suggest a group collection at the beginning of your holiday to cover drivers, guides, porters and hotel staff (including restaurant, kitchen and reception staff) of approximately £30 (or the equivalent amount in local currency). Your Tour Leader will collect this on your behalf and distribute it accordingly, thus relieving you of the burden of who, when and how much to tip. The tipping of bar staff and housekeeping will be left to your individual discretion (a small amount left in your room on departure should cover this and would be much appreciated). As is customary, ‘the hat’ will be passed around for the driver and guide on all optional excursions. For any meals that are not included in your itinerary, or taxi fares, your Tour Leader can advise of an appropriate Ͽo add on. The emphasis is on casual clothing for throughout. Comfortable shoes or walking boots are recommended. Dressing in layers and waterproofs to allow for changes in the weather is recommended. Please bring some warm clothing for example a fleece and warm outer jacket for the evenings and early mornings. On safari, it is advisable to wear long sleeves and trousers to provide protection against insect bites. On safari avoid clothes with very bright colours as this may irritate the animals, preferably wear clothes with brown, khaki or beige colours. Binoculars are also recommended. A cap or wide brimmed hat to protect from the sun and sunglasses are recommended. YOUR TRANSFER HAS BEEN ARRANGED WITH SPRINGBOK ATLAS. IN THE EVENT YOU SHOULD ENCOUNTER ANY ISSUES WITH YOUR TRANSFER IN RESORT, PLEASE CALL 00 27 082 318 1891. IN THE EVENT YOU SHOULD ENCOUNTER ANY PROBLEMS ON ARRIVAL DAY AND NEED TO CONTACT THE LODGE PLEASE CALL 00 27 (0)13 590 1011.